Refugee Outreach Collective is fundraising for the startup costs of aspiring businesswomen in Dzaleka Refugee Camp, Malawi. These funds will help the women attain financial stability within the economic, political and social constraints of the camp. Dzaleka Refugee Camp, Malawi has a vibrant, community-driven market economy. In the camp, small startup businesses thrive and are a means for refugees to gain financial independence. According to There is Hope-Malawi, Dzaleka is home to approximately 40,000 people. We are working with women to give them the means necessary for them to attain their long-held business aspirations. Women in this program are experienced in their trade, and have the skills and drive necessary to create and sustain their own businesses. The biggest barrier is the startup costs. All have prior experience with similar businesses in their country of origins. These women had to leave everything they had behind and start a new life for themselves and their families in Dzaleka, a place where they are largely dependent on community support and foreign aid. Pictured below are three of the women we have sponsored thanks to the generosity of donors. Julia fled from the Congo and has been living in Dzaleka for 10 years now. 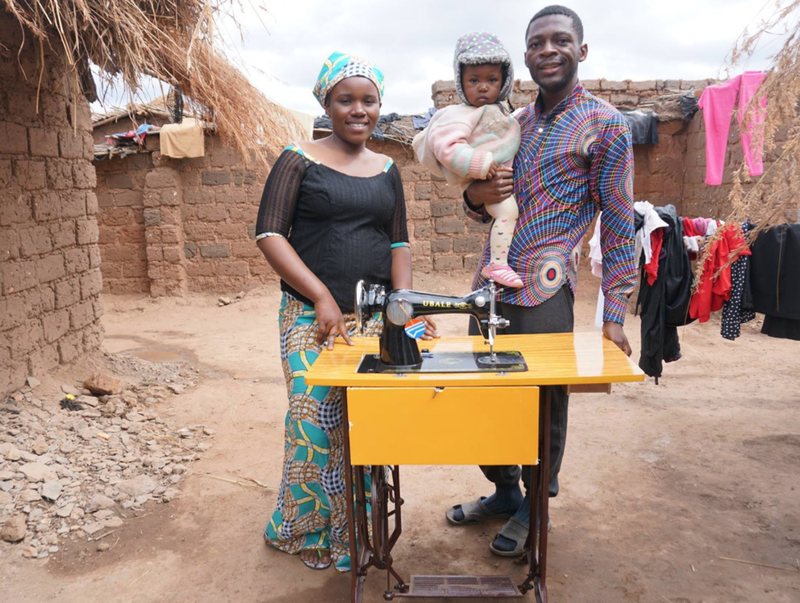 Julia is pictured with her husband and baby next to her new sewing machine! Julia and her husband are both modeling clothes that she has made. When we asked her why this sewing machine was important to her she said it would provide her the means necessary to support for herself, her family and to help her fellow community members. We sponsored Josephine’s tailoring business, thanks to the generosity of international donors. Josephine has lived in Dzaleka for ten years, and only has herself to rely on within Dzaleka. Prior to receiving her sewing machine, Josephine was working on a friend’s sewing machine which required her to pay them half of the profits she earned. Josephine is one step closer to financial independence within Dzaleka, and explained that she plans on teaching her neighbors how to tailor so they too can make money. We worked with generous donors to support Anas’s hairdressing business. Before fleeing D.R. Congo, Anas was a hairdresser. Since making Dzaleka Refugee Camp her home she has taught many of her fellow community members how to also hairdress. 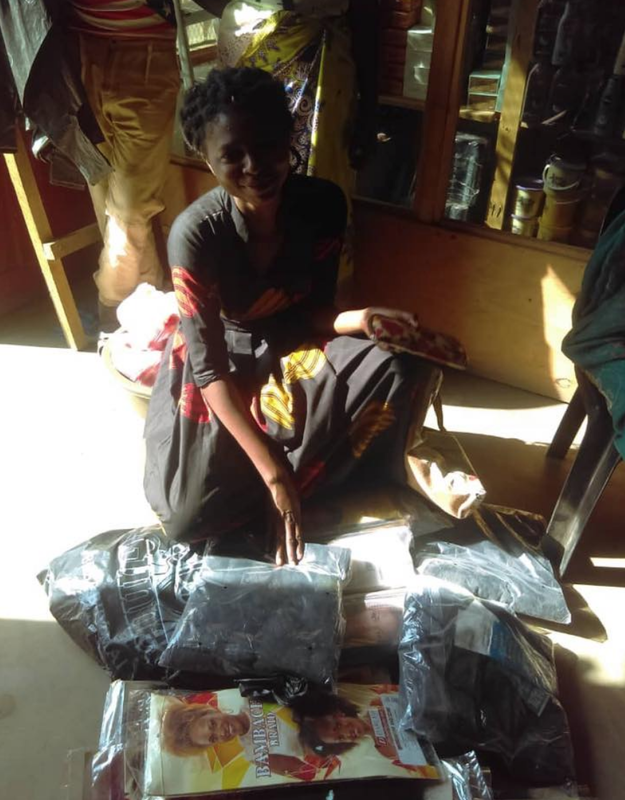 Anas will continue her volunteering efforts and looks forward to beginning her hairdressing business to jumpstart her way to financial stability within Dzaleka!